The changes mean that rubbish will be collected by all companies on specific days in certain areas. IF YOU LIVE in the Dublin city area, you’ll want to check on the latest changes to rubbish collection before you put out your next bin or bag. Dublin City Council recently introduced new by-laws and under them it entered talks with waste collection companies to organise a specific day for different areas during which household rubbish would be collected. Regardless of what waste provider they use, everyone living in certain areas will have their rubbish collected on designated days. 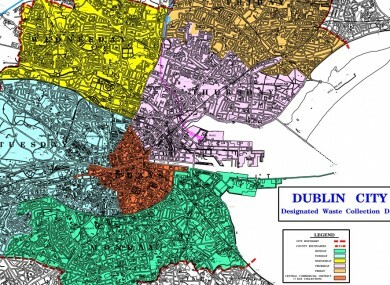 You can find out more by looking at this Dublin City Council map and pinpointing the area where you live. The fact that several waste collectors now operate in Dublin means that communities were being inconvenienced by numerous bin trucks in their area on a daily basis with resulting difficulties of footpaths blocked by bins, littering and traffic issues. These Bye Laws will ease these problems considerably. He said that Dublin City Council’s Waste Management Services held talks with domestic waste collectors as part of the process to decide on the collection days. All waste collectors are currently informing any customers who will require a change to their collection day. About 44,000 customers will see their collection day change as a result. One campaigner who has been involved in raising awareness of the issues around illegal rubbish dumping in Dublin city told TheJournal.ie he believed the move “will certainly eliminate the sight of rubbish around the place”. It’s not going to take the problem of illegally dumped rubbish away – a lot more work needs to be done to tackle rogue landlords who don’t give a crap about their property or the tenants who live there. This is a huge problem in the north inner city. He also raised the issue of landlords being made to provide bins, “appoint a tenant to take out the bins for collection and return afterwards and get something off their rent” suggesting that this would solve “a huge amount of the problem”. Do you welcome these changes? Tell us your thoughts in the comments below. Email “Changes to 'ease problems' with Dublin rubbish kick in on Monday”. Feedback on “Changes to 'ease problems' with Dublin rubbish kick in on Monday”.